← Getting dumped: Facebook vs. Reality. This entry was posted in Grammar Comics! and tagged bum, comic, comics, funny, grammar, grammar guru, guru, homeless, i before e, spelling, spelling rules. Bookmark the permalink. Try learning Hungarian or Finnish for a real mind boggle. At least Spanish can be spelled phonetically though. Great post btw! Very true. English spelling can be zany: “knight”? Why would it ever be spelled that way? Thanks for the comment! Hahaha. That’s awesome. Perfect example of why the English language is totally crazy, and yet I still love it so. After all, how else would I bamboozle audiences across the blogosphere. Also, we get words like bamboozle, and callipygian, and perfunctory! I won’t lie, I had to google callipygian. I tip my hat to you, sir. Such nuance to our language — such that even poor Grammar Guru doesn’t always have the answers! Great work! Grammar reminds me of phonics which reminds me of the nuns in grade school…owwww!…what a diphthong! 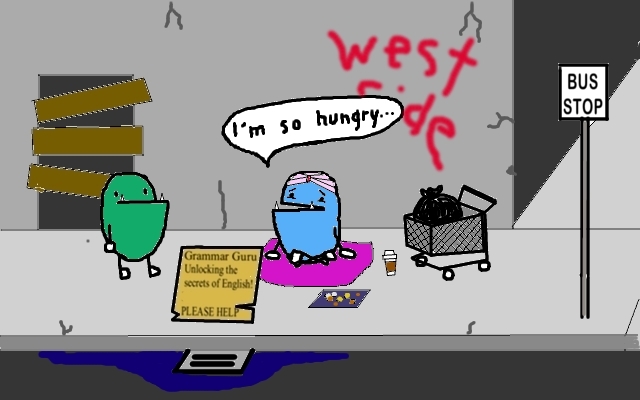 I need a grammar guru – even a hungry one will do! An attractive one, though! I’m sure you’d agree that there needs to be more grammar in English classrooms. The english language is a great example of something that was produced by the principle of “make it up as you go along”! I dunt no wuht yaz mean. Englesh is a eerzie languwidge to spell. Looked it up and clicked on the first link. Read the whole page, and now I have a headache. XD But I have to admit, they do have some good points. I think. Did I read it right? Just thinking about this makes me mad. Can’t tell you how many apostrophe errors I’ve seen on storefront windows. I approve looting of these businesses. HAhaha, this is SO funny! I love it. Will share it with my feisty friends. It’s true, English does have a lot of irregular words that don’t fit the general pattern/rules. i before e except after c and when pronounced as ‘ay’ as in neighbour and weigh. I learned that from Brian Regan. Hilarious, and once again proving that in the English language, there are five exceptions to every iron-clad rule. Congrats on being fresh-pressed. Where were you when I was trying to teach grammar to my students? I could’ve used your talents to get some of those stickier points across! Thanks for sharing. That was amazing! Love it. Oh my god, the weird wonders of English wrapped up in a cartoon…. Congrats from one Freshly Pressed-er to another. Love the post. Odd spelling is probably the result of hundreds of years of being occupied by many invaders from many countries, innit? I don’t like using ‘innit’. I’d rather use ‘isn’t it?’, but ‘innit’ is an example of an evolving language just like any other. It may be that the English didn’t steal aspects of other languages. Other languages were probably assimilated into English through their occupation. @chelseavose: Those who have learnt it as their first language are not spared the trouble though. Natives often mistakenly think so, but there are always loads of fine points that you just can’t get the better of. Would probably have been a lot harder to learn other languages in that case. Agreed, and that goes for languages in general. I have learnt a lot about the rules of my own language (Swedish) in trying to teach it to others. Maybe one day, we will speak “Simplified English” instead of “Traditional English,” like what has happened to mainland Chinese. 🙂 Can’t say I’m looking forward to that day either though. Oh, you think you’re funny making fun of the homeless, do you? You should be ashamed of yourself. Just kidding! First Daniel Tosh with his ‘Febreze the homeless’ bit, and now you. Great little cartoon. They do say that the exception confirms the rule ! Cool cartoon–I read with great trepidation because I tutor creative writing and SAT Critical Reading–yikes! Am SO not a grammarian, and I warn parents and students of this. absolutely funny. Grammar guru is completely stumped. Great fun read! Loved it a lot. Woe is me, because I’ve recently caught myself (more than once!) 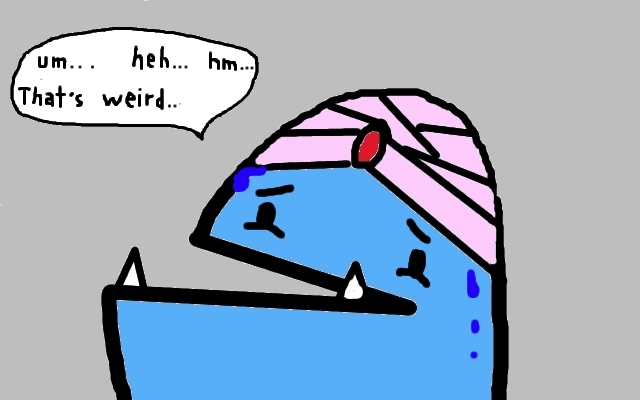 trying to spell ‘weird’ as ‘wierd’ and only after too many moments realizing how wierd that looks. I mean weird. I´m Spanish and I speak other languages. English isn´t as difficult as it seems, it´s just a matter of paying more attention to what we say or write. Spanish is more difficult and its grammar is worse than the English one. The only advantage for us is that we write the same that we speak. The main problem I see with English is that people don´t distinguish certain words when spelling or writing, I´ve met a lot of natives and it never ceases to amaze me the amount of grammar and spelling mistakes they do. I think that people don´t care or don´t pay attention when they learn. Reading is very helpful and useful to learn and/or improve a language. It is very surprising to me when I find out that certain people whose native language is English are unable to see the difference between ” their” and “they are or they´re”, between “hear” and “here” , between “it´s” or “its” or when they write “must of” instead of “must have”…etc. If I can speak and write correctly in a language that isn´t mine, why can´t natives? To answer, in short – All the mistakes you have mentioned are usually not mistakes due to a lack of understanding, but rather misspellings because of phonetics. Unfortunately, a lot of people (English speaking and otherwise) don’t write enough, and as a result their skills suffer. Things like double exclamation marks as well? I can see why you were Freshly Pressed! The grammar guru in Jen’s office should read this! Oh, i loved this!! Thanks. Thanks so much; with my crappy decade-old mouse, the drawings take ages to do. Glad you like ’em! English is so rightly regarded as one of the toughest languages. Even Indian languages like HIndi and Tamil and I know are not as random as certain ‘rules’ in English. I wanted to go in and give the guy a pat on the back and tell him thanks for setting a new standard of phonetic spelling. Instead, I took a picture on my phone and sent to all of my friends so that we could all sit around and laugh at the poor guy. Also, what gets to me is the way our dictionaries have just begun to accept misspellings and mispronunciations as a secondary or informal version of the correct form. Regardless of Websters’ tendency to simplify and dumb down our language, I still believe in the correct way as opposed to the incorrect way. Did I get off topic? I think so. Damn soap boxes… they always run away with ya. this takes me back to 2nd grade when I lost the spelling bee spelling nieghbor wrong – dammit – did i do it again?!? Thanks for the humiliating laugh. That was a fun and refreshing post. I enjoyed the cartoon style. Cheers! I believe someone came up with the rule I before E except after C before the words weird, ancient, neighbors, etc were invented. I once read in a book that there is only one word in the English language, out of which can be made a sentence of any length using only that word. As a grammar guru, you may know this but if not, the word is “buffalo.” Hard to believe, but the key is that buffalo is a noun and a verb (meaning to intimidate by show of force) and the spelling is the same whether plural or singular. It works like this. Buffalo! That’s a one-word declaration you scream when buffalo are running at you. Buffalo buffalo, means buffalo intimidate. Buffalo buffalo buffalo means buffalo intimidate buffalo. The best part is when you add the fifth buffalo. Here’s the insite. Take this sentence: Dogs that kids like are nice. In this sentence you can drop the “that” and it’s grammatically okay. Thus, Dogs kids like are nice. So: buffalo that buffalo buffalo, buffalo buffalo. That is, buffalo that intimidate buffalo intimidate buffalo. Now drop the “that.” Buffalo buffalo buffalo buffalo buffalo. Which translates to: buffalo that buffalo intimidate, intimidate buffalo. Thought I’d share for you and your readers. Great blog. Interesting — I’ve never heard that before. That has got to be the strangest sentence I’ve ever seen. Thanks for sharing that! I remember being taught the rule this way “i before e except after c except when said ay as in neighbor and weigh” which is a helpful if you don’t consider words like weird and ancient. Of course this is why I never really cared for grammar. It makes no sense. I was the same way, but learning about it puts a LOT into perspective. Trust me! Enjoy the comics! I think you should put some kind of copyright notice on your drawings or something that will track back to you/your website. I think there will be a lot of people taking your work without your permission. You may not mind people using your work, but I think it is only fair for you to be recognised for it. All work is copyrighted, but thank you for your comment — a very valid point! Very funny post. I never think of how weird English is since it’s my only language, but it really is, isn’t it? Hahahahaha great post. Keep bringing us Guru! This is so true! I always think how hard English would be as a second language because of words like their, there and they’re and its and it’s and most of the time there are not definite rules to follow! Loved this. The basics are actually quite simple, but mastering it is definitely tough! thanks for your comment! I remember this rule of “i before e except after c” from the Charlies Brown movie “A Boy Named Charlies Brown” and chant it in my head while writing when in doubt! As always there must be exceptions, damn! Thanks for your cartoon . . .it too will probably stick in my head now! I take exception to glaring grammar errors and hope I don’t make too many myself when writing my blog, though I do use many exclamation points. I’m very fond of them for emphasis! I had so much fun while reading it, or perhaps seeing it. Thank you for that! Awesome!, I like you post. I get especially tickled at word play/grammar jokes, so I really enjoyed and appreciated this. Thanks! Hope you enjoy the comics! I love the way some people use words, I guess that’s what makes them stand out. I love this because I have never associated being skilled at grammar with being skilled at spelling. To me, they’re just two separate entities entirely. I could diagram the heck out of some sentences but for sure be disqualified within the first round of a spelling bee! Superb! Wish I could draw. Years ago, and I mean MANY years, I had a sign on my dorm room door that said “Seize the Day”. Someone in my dorm crossed out the “Seize” and wrote “Sieze” – with the rule in parentheses. I was so glad they were of such help. Heh. It’s always men’s and women’s. “men” and “women” are plural nouns already, so “mens” and “womens” are both never correct. Thanks for the comment! I was also an English major but got obsessive over grammar only after getting into teaching. Cheers! This is fabulous!!! 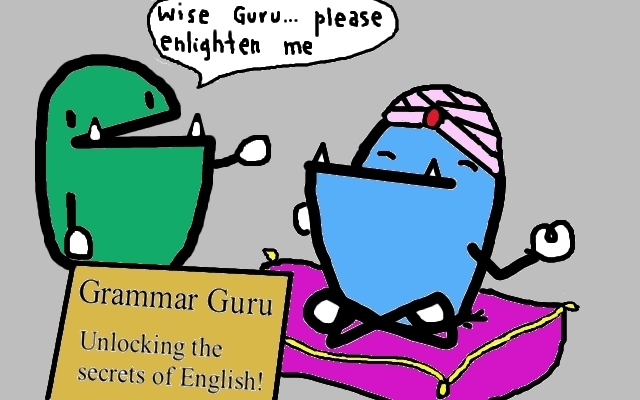 I am delighted to have found Grammar Guru, as grammar and punctuation are an obsession of mine, as well. I can’t wait to read through the rest of your site and will be returning often! The joys of the English language. More grammar rules fall into the exception. It’s a wonder it’s a global language. 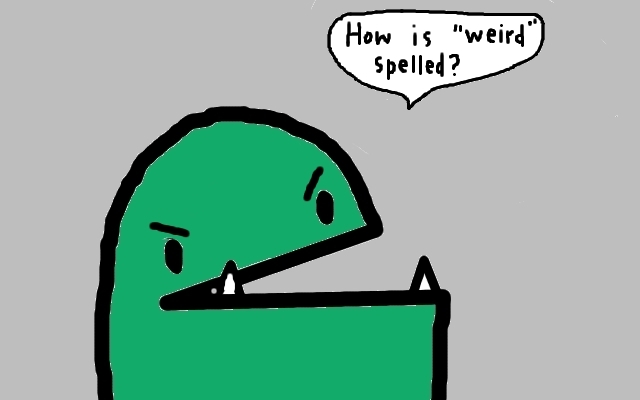 Weird is spelled with the e before the i. You can’t have weird without the we. The slogan of my blog used to be Hunter S. Thompson’s saying, when the going gets weird the weird turn pro. I spelled it wrong at first, until someone corrected me. How can you fault a person for spelling weird wrong when they quote Hunter S. Thompson. LOL! This was great! Feel bad for the guru though! English language! The 7th wonder of the world! This is a great site! I have read almost all your posts! I am one of those crazy people who actually enjoyed diagraming sentences in High School and College. I was a Communication Disorders major so maybe that’s why :). Keep up the good work! HaHa! You made my morning, thanks! The original (British) English was already full of mistakes to begin with because not many people could spell back then. Actually, not many can spell now. 2. 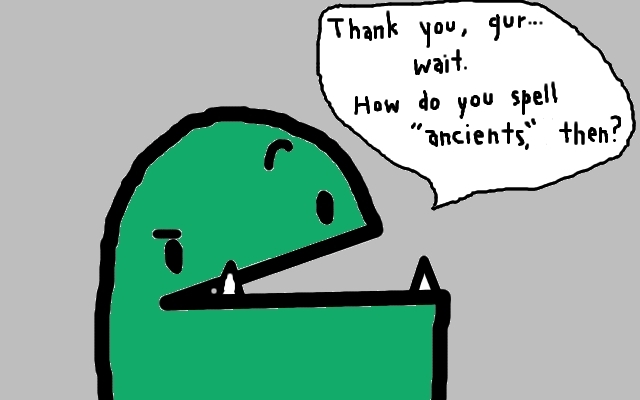 How do you spell ancient? A-N-G…? Its one of those common things that we are always told as students but when you really think about it doesn’t work! You are hilarious! I’m new to wordpress and please check out my blog and follow back! I love it…..but please don’t sign up for my blog! I am for sure not a grammar-guru. I love the I before E except after C rule and I use it all the time, just because it is the rule. I love writting to my cousin Kieth. Haha! I’ve got a friend named “Niel” too. Funny stuff — thanks! Hahah. great comic. I did a really cool grammar project a few years back for my senior project for my undergrad and it was infuriating to get all the rules right while rhyming! It’s actually on my blog now if anyone cares to gander. Some of these rules are absurd! Frankenstein language! We just had this discussion over the Sunday crossword puzzle, so it’s ironic that I would have come across it today! I think that grammar is not an exact…science (i before e except after c)? love this! i majored in english and would often marvel at how schizo it was. gotta love it! Wouldn’t you need three slices of bread to make a bread sandwich? English has so many branches it can be very hard at times to store all of it at once.For the most part we even have word definitions that change so much it is hard to keep track half of the time lol.Love the cartoon very funny indeed,thank you for the post. Ps.First laugh I have had all day really needed that!!! 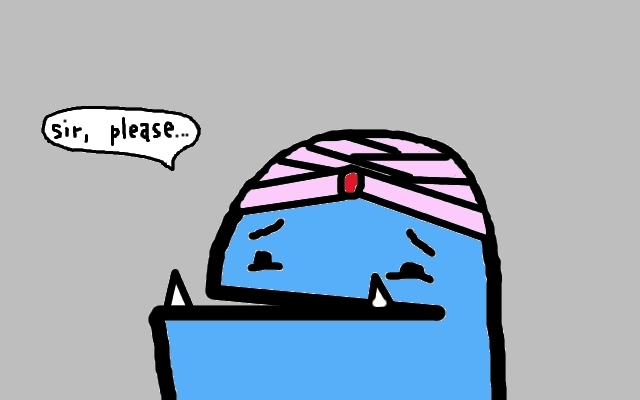 I think I feel too much for crudely drawn yet very expressive cartoons. I’ll be getting a tablet soon. Perhaps that’ll smooth out some of the roughness of these little guys? Please don’t make them too smooth! I might not recognize them. )= Also, I don’t want to weep into my pillow over the unfairness of the world. I do that enough each time I see a spread in Sports Illustrated featuring the perfectly Photoshopped bodies of aliens from supreme race models. As a former adjunct in English composition, I LOVE this blog! As As a writer, I LOVE this blog. 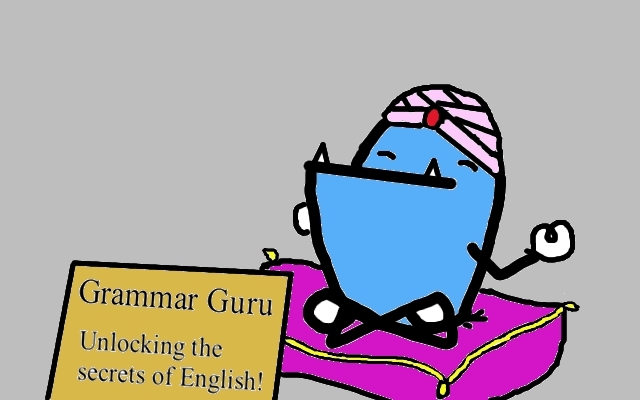 As a stickler for grammar, I LOVE Grammar Guru! Great information with humor and art. Hello my friend, your blog helped in understanding English language more. Plus I enjoyed your comics a lot too. They always make me laugh especially this one “Grammar Guru” . When I was in third grade, I remember a teacher telling me, “You spelled ‘their’ wrong.” And I replied, “No I didn’t! 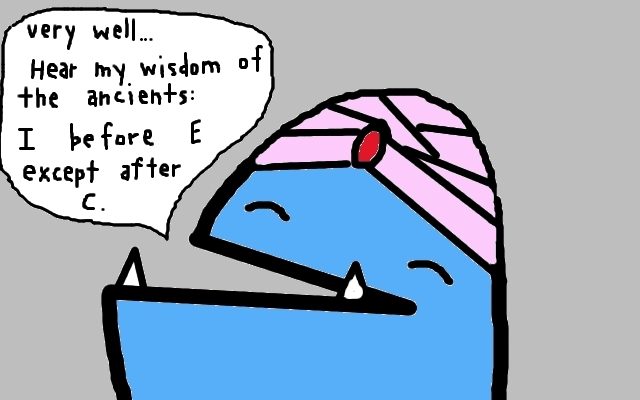 I before E except after C!” It was a long time until I finally changed my ways.